I sometimes miss the braised beef noodle (牛腩面) in Hong Kong. My husband and I tried a few Chinese noodle places here in The Netherlands, but none of them got it right because the beef was not tender enough. 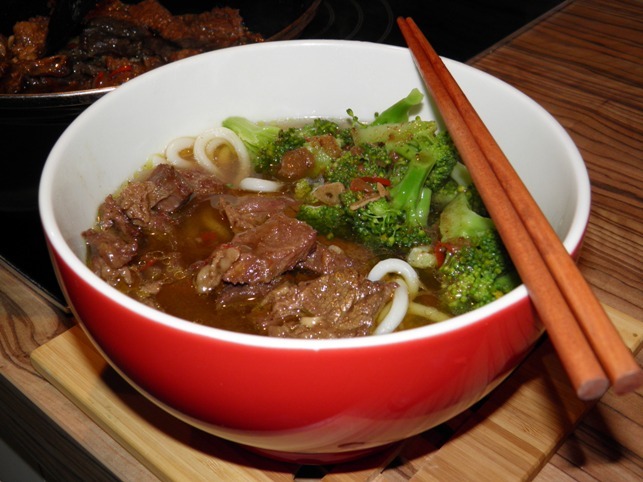 Many chinese recipes call for many unfamiliar ingredients that I have no idea what they are and where to find them, so I never give chinese style braised beef a go. I found this simple recipe at BBC Good Food website by accident and decided to give it a try. It got thumbs up from both myself and my husband! Okay, it was a little sweeter than the braised beef in Hong Kong, but it was still really good. My husband had it with udon noodle, and I had it with rice - and both were fantastic! 1. Heat the oven to 130 degree C. Toss the beef in flour, and season with salt and pepper. 2. In a Dutch oven, heat 2tbsp of oil and fry garlic, onion, ginger, and chilli until fragrant. Set aside. 4. Fry the five-spice and the ginery mixture over high heat until fragrant, then add sugar and beef. Stir well. Splash in the sherry and scrape up any meaty bits. Pour in the soy sauce and stock, and bring to a simmer. 5. Tightly cover the Dutch oven and cook for about 1 hour. Stir well, then cover and cook for a further 1 hour.